The All Progressives Congress has emerged as the political party with majority members in the House of Reps, a first by an opposition party in Nigeria since 1999. By this development, the APC overtakes the Peoples Democratic Party as the dominant party in the House. The PDP has dominated the House since Nigeria’s return to democracy in 1999. The deputy chairman, House Committee on Media and Public Affairs, Hon Victor Ogene, yesterday released new figures showing distribution of House members and their party membership. The new distribution shows: APC (179); PDP (162) other parties (19). The House has 360 members. 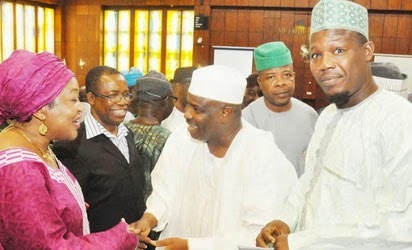 On Wednesday, the gales of defection continued in the House of Representatives as 10 members defected to other political parties largely on account of failed return bids in last year’s primary elections conducted across the country. In separate letters of notification read at plenary by the Speaker of the House, Hon Aminu Tambuwal, the federal lawmakers cited ill-treatment by their former parties during the primaries. The members are Chukwuemeka Nwogbo, Victor Afam Ogene and Fort Dike (APGA to APC, Anambra); Ibrahim Bawa Kamba and Garba Musa Gulma (PDP to APC, Kebbi) and Abdulmalik Cheche (PDP to APC, Niger). Others are Wilson Nathaniel (PDP to SDP, Adamawa); Zakari Ibrahim (PDP to APC); Madueke Anthony (PDP to PDM) and Benjamin Aboho (PDP to APGA, Benue). Their defections followed similar action by five members on Tuesday who changed political parties.